to sign up for the 1 year package at an exclusive rate - only for HJGT players! We are excited to announce our new college recruiting partner, Recruiter Elite! 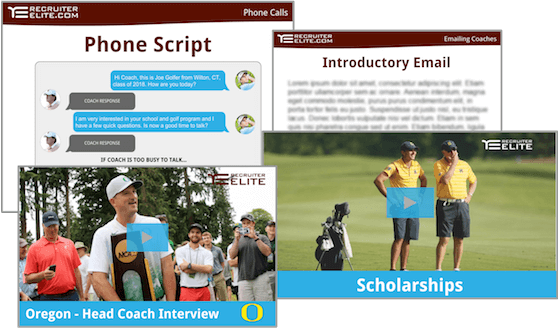 Exclusive to the HJGT, Recruiter Elite is offering free consultations with members and discounts on Recruiter Elite Online Memberships. You may email coaches at any time, as often as you like. College coaches may email you beginning September 1st of your junior year. If you want to plan a visit before September 1st of your junior year you must call the coach and arrange the visit. Shorter is better: A coach is more likely to read your whole email if you keep it brief and to the point. Research: Make sure to research schools before sending out initial emails. If you fall well outside the academic and athletic requirements for a school, you may not even get a response. Personalize all your emails! Mention why the specific school interests you so much. You can also wish the team luck on their upcoming tournament or compliment the coach on the team’s recent finish. College golf recruiting is so competitive, if you don’t take the time to personalize your emails, other recruits will.Check grammar and spelling: I recommend download Grammarly – grammarly.com to your Gmail email account. It’s great for catching grammatical errors! What to consider when starting your search. Can I get into this school based on my academic record? Do I have the athletic skill to play for this team? Can I give the coach a good reason to recruit me? Is the coach truly interested in me? Can I afford to pay for this school? Does the school offer academic programs and majors that interest me? Will I be happy with my college experience here? Timeline for building a school list. Freshman: Start building a general list of schools you might like to attend. Take visits to as many schools as possible to help narrow down what types of schools you might be most interested in. Sophomore: As you refine your list, start filling out all categories for schools you are interested in. Speak with your high school advisor about class selection and extracurricular activities to increase your chances of attending your preferred schools. Junior: Your school list should be nearing completion and comprehensive by the end of your junior year. Add and remove schools in relation to your preferences as you visit more schools. Consider speaking with admissions at your most preferred schools to discuss your chances of acceptance and what you can do to improve them. Senior: Begin narrowing down your list of schools starting in your Junior to Senior summer and fall semester of Senior Year. This will be helpful in deciding at which schools you take official visits. Where do I get started with my resume? Length: Considering all resumes are sent digitally, fitting all your information onto one page is not crucial. It is more important you document all appropriate tournament results. You will consult with your advisor on which events to keep and remove. How many tournaments should I list: A good rule of thumb is to post your 10 best multi-day tournaments per year. 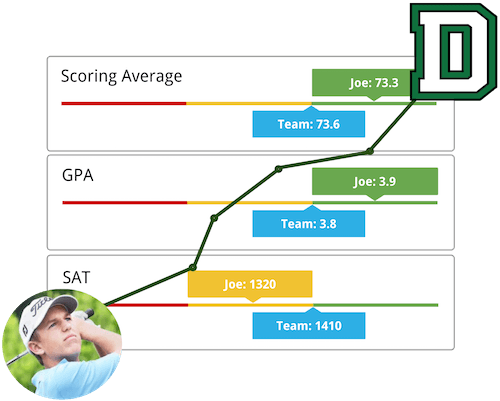 Where do I find my results: Going to Junior Golf Scoreboard is a great place to start. 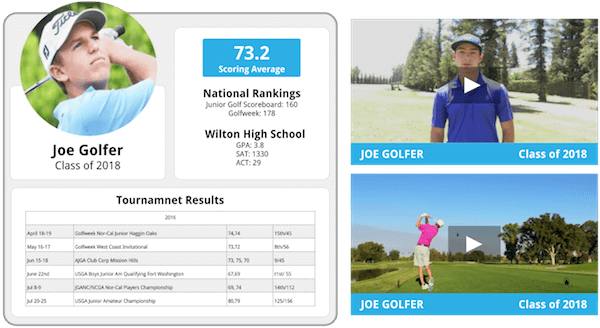 Every tournament on your JGS profile will be an event worth posting to your resume! Triple check results: Coaches do backcheck tournament results. Make sure all your scores and finishes are accurate. It can be easy to guess on your finish, but make sure you check! You may call coaches at any time, as often as you like. Coaches may call once a week after September 1st of a player’s junior year. Remain Talkative: You should be the one engaging the conversation. Show your sincere interest about the golf program by leading the conversation with intelligent questions. Personality: Coaches want players with personality and confidence.Independence: Your parents don’t need to 3-way call/ make calls for you. Voicemails: Practice leaving messages for coaches on your home phone’s voicemail. If you were a coach would you call yourself back? The player pays all expenses. No limit to how early you may take visits. No limit to a number of unofficial visits you may take. Allowed to meet on campus with coach(s), current players, admissions staff, academic advisor, and trainers. Email 2 weeks in advance to schedule a visit. Follow up with phone calls. Keep in mind, coaches can’t respond to emails or voicemails until Sept 1st of a player’s Junior year. For Freshmen and Sophomores, keep calling until you get them on the phone! Start calling 2 weeks in advance and be persistent. At the least, try to schedule a 30-minute meeting with the coaches. Tour golf and athletic facilities. 30-minute meeting with Head and Assistant Coach. If a coach has come out to watch you, you have already won half the battle. Your tournament finishes and academic profile have proven enough for a college coach to want to come and see you perform. This is what you should know. Coaches look for players with mental toughness and maturity. Coaches demand great attitudes from their recruits because it’s more difficult to improve a player’s attitude than it is a physical golf skill. Coaches want to see players react to all situations, good and bad, with composure, no matter how the round is going. If you deal with adversity more professionally than the coaches existing players that’s a huge plus for you! What else do coaches look for? Do you go through your routine on every shot? Do you have a bad attitude during practice? Are you socializing or focused on efficient practice? Player Appearance: Look like a young professional. Give the coach a preview of an individual he would want representing his team on and off the course. Are you well groomed? Are your clothes clean and ironed? Are your shoes clean? These are all things coaches consider. Parents: A supportive relationship between player and parents can mean a lot to a college golf coach. A good player-parent relationship often translates over to a good player-coach relationship. An argumentative, unhealthy player-parent relationship can be a sign of future relationships with the coaches and other players. College scholarships help students achieve their peak academic and athletic potential. A scholarship is a one-year agreement between the player and coach. 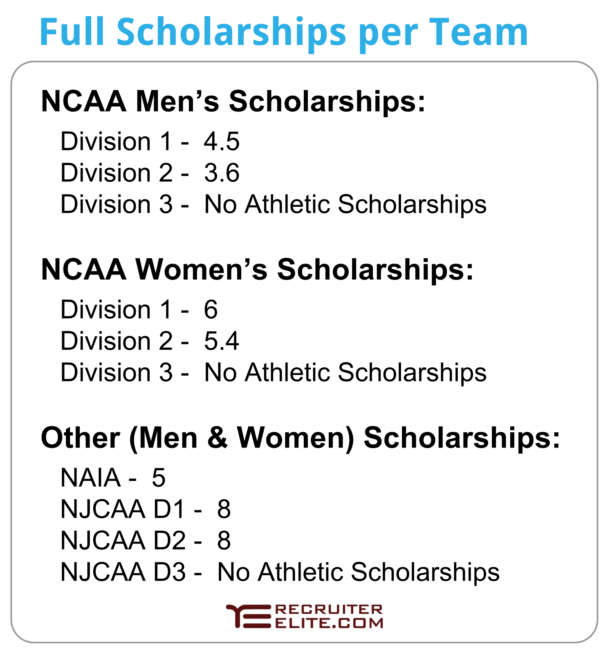 If a player continues to meet team requirements and expectations he or she is likely to maintain or increase the scholarship. Full Scholarship: Includes tuition, fees, books and room & board.